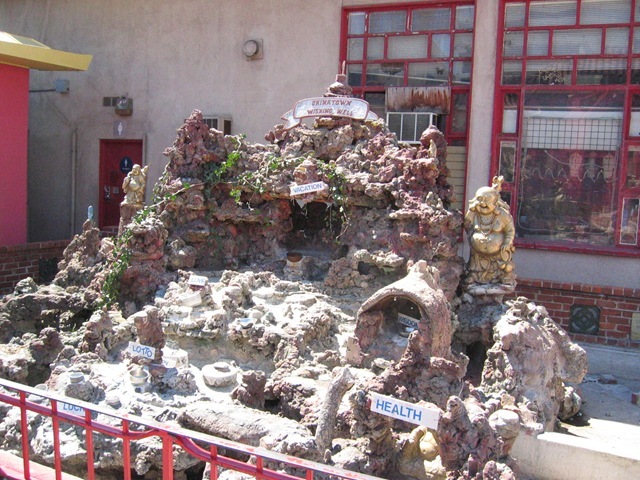 This image of a wishing well on Broadway in Chinatown built by professor Henry K. Liu has been listed on EBay. If you have looked at Charles Owens and Joe Seewerker’s “Nuestro Pueblo,” (which you really should) you might recall it. Bidding starts at 90 cents, or Buy It Now for $4.99. You might also consider tracking down a copy of “Nuestro Pueblo,” which includes terrific artwork by The Times’ Charles Owens. 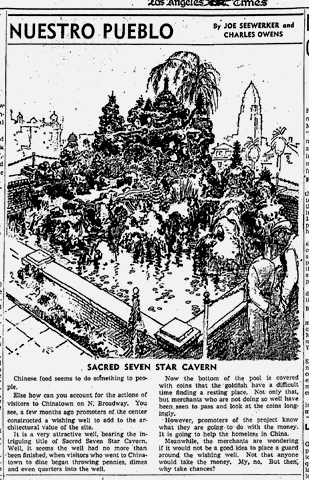 And here’s the wishing well in a photo on Wikipedia by Arnold C and uploaded by Buchanan-Hermit. This entry was posted in Architecture, Art & Artists, Books and Authors, Found on EBay, Nuestro Pueblo and tagged #Chinatown, #EBay, #la. Bookmark the permalink.